Can drinking coffee help a person sober up? As seen in "MythBusters: Alcohols Myths." Explanation: When you see a movie scene showing a drunk guy trying to sober up in a hurry, odds are he'll be chugging a cup of stout black coffee to help speed up the process. But can a person who is drunk function better — and possibly pass as sober — after downing a cup (or two) of joe? A few rounds of drinks, several cups of black coffee and a series of tests to measure hand/eye coordination reveal the answer: A resounding "no." Coffee does not help you get sober. If you're plastered, you're going to have to wait several hours for the alcohol to leave your system on its own. 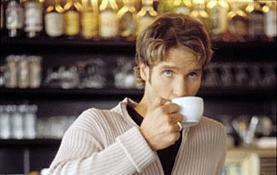 Drinking coffee won't make your body metabolize alcohol faster. However, coffee can affect your drunken state by tricking your mind into thinking you're close to sobriety. It turns out the caffeine in coffee is a stimulant, which can make you feel like you're ready to handle certain potentially dangerous activities — like driving. But beware! If you're drunk, coffee can't actually prepare you to get behind the wheel — it'll only make it harder to realize you're sloshed..